Instantly ruining years upon years of Internet fan fiction, J.K. Rowling returned to her Harry Potter universe for a new short story that offers a glimpse of the boy wizard and his friends in their 30s, when it becomes time to put away childish wands and speak as a man-wizard. It’s not the first time Rowling has revisited her successful fantasy series; she’s written various other short stories, and she’s currently developing both a prequel stage play and the spinoff film trilogy Fantastic Beasts And Where To Find Them. But it is the first time she’s explored her characters as adults after the epilogue of the final Harry Potter novel in 2007. 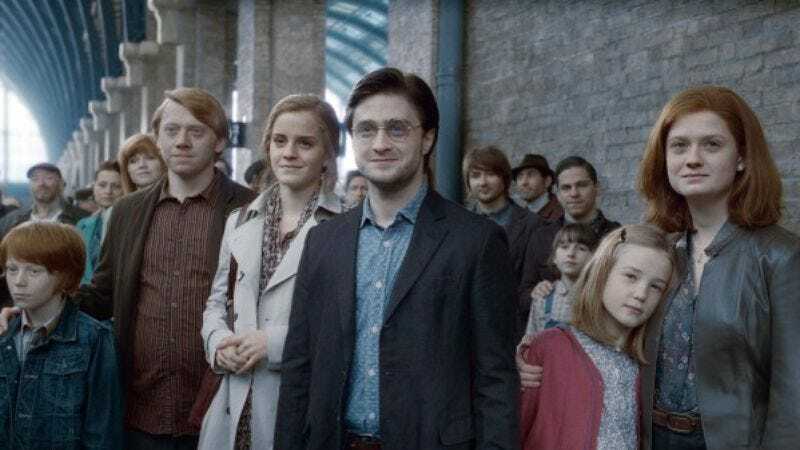 Since then, fans have mostly been left to use their imaginations about all of the adventures those characters probably stopped having, because they are grown-ups and have to go to work in the morning. That is, until the 1,500-word article published on Pottermore.com—and available only to subscribers—which Rowling has written in the form of a report by gossip columnist Rita Skeeter, in attendance at the Quidditch World Cup final. According to excerpts on The Bookseller, it’s full of tabloid details on the lives of Harry (still wearing round glasses “that some might say are better suited for a style-deficient 12-year-old”), Ron (co-managing Weasleys’ Wizard Wheezes), and Hermione (juggling motherhood with working at the Ministry of Magic), and several others. It’s all very illuminating to people who have read and watched and adored Harry Potter—which is a group that, unfortunately, does not include me. Fortunately, through the magic of IM, I was able to reach out to our departed Harry Potter expert Genevieve Koski (who’s helped me out twice before) to make sense of this. For Harry Potter scholars, this conversation is considered a substitute for the text. For those who would like to read more about the scars and hair of wizards, Rowling’s story is available here.